Use your browser's search function (usually Ctrl+F) to find what you're interested in. NEW (Dec 2011)! Are there plans to update the book? Can I sell the PDF Edition? Can I include the PDF Edition as part of a product I sell? If I download the PDF Edition of Ubuntu Pocket Guide and Reference, do I get the complete book? I've downloaded the PDF file from somewhere other than your website. How can I be sure I've got the full thing? Can I really share the PDF Edition with friends, and even upload it to file sharing networks? Is this a time-limited offer? Do you plan to start selling the PDF Edition of Ubuntu Pocket Guide and Reference? Is the PDF Edition of Ubuntu Pocket Guide and Reference a demo version? Do I have to stop reading it in 30 days? In short, what's the catch? Do I have to buy the Print Edition of Ubuntu Pocket Guide and Reference if I download the PDF Edition? Why are you giving away the PDF of Ubuntu Pocket Guide and Reference when most publishers sell PDFs? I sell computers with Ubuntu preinstalled. Can I include the PDF Edition of Ubuntu Pocket Guide and Reference with computers I sell? Does the fact Ubuntu Pocket Guide and Reference is being given away mean that ALL of Keir Thomas' books are being given away in PDF format? My workplace has switched to using Ubuntu and I'd like to pass around the PDF of Ubuntu Pocket Guide and Reference to my colleagues. Is this allowed? I hate PDFs! I wanna convert the PDF file to HTML, or plain text, or Latex... Can I do so? Can I offer the PDF Edition for download from my website? Why do some screenshots in the book appear to have thin white lines on them? Why do some appear to be blurred? Is the PDF corrupted? It doesn't seem to display correctly on my computer (or it just doesn't open). Is the PDF corrupted? The file size and md5sum I see aren't the same as what's listed on the download page. What are the vital statistics of Ubuntu Pocket Guide and Reference's Print Edition? 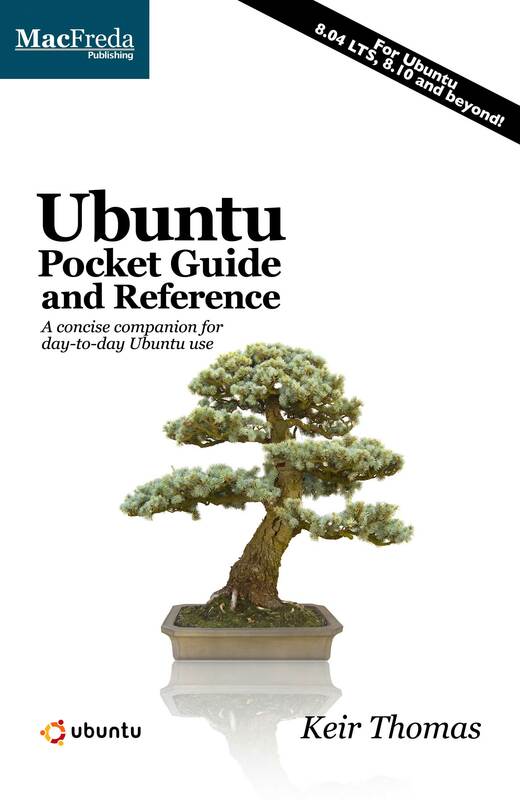 Where can I buy the Print Edition of Ubuntu Pocket Guide and Reference? Why can't I find the book on my country's Amazon website (i.e. Amazon.co.uk, Amazon.de etc)? I run a bookstore but can't find Ubuntu Pocket Guide and Reference listed in the channel catalogs. Why? I ordered the Print Edition but it hasn't turned up/it's turned up but it contains printing errors. Is Ubuntu Pocket Guide and Reference community documentation? Is Ubuntu Pocket Guide and Reference sponsored by Canonical Ltd, or the Ubuntu Foundation? Is the author some kind of slightly insane Ubuntu/Linux advocate? I've spotted a mistake in Ubuntu Pocket Guide and Reference. How do I tell you? Can I reproduce excerpts from the book on my website? Is Ubuntu Pocket Guide and Reference part of the Pocket Guide series from a popular computing publisher whose name sounds like "Oh, really"? If you're giving-away Ubuntu Pocket Guide and Reference for free, does that mean it's copyright-free (or in the public domain)? Any plans to do a version of the book focussed on Kubuntu/Xubuntu? Any plans to do a version of the book focussed on my favorite distro (that isn't Ubuntu)? Can I translate Ubuntu Pocket Guide and Reference into my language? You used the Ubuntu logo on the cover of the book! This is illegal! I don't want to buy the Print Edition but I'd like to thank the author for the free PDF. How can I do this? What's the difference between Ubuntu Pocket Guide and Reference and Keir Thomas' other guide to Ubuntu (Beginning Ubuntu Linux)? Can I have a copy of the totally unofficial but otherwise cool "Switch to Ubuntu" badge that's on the main page? Where can I find a high-resolution cover image? Yeah! The PDF Edition of Ubuntu Pocket Guide and Reference is exactly the same as the Print Edition. Word for word, screenshot for screenshot (actually, this isn't quite true—the PDF Edition has an extended table of contents showing more detail, so you could say it's even better than the Print Edition). The PDF Edition has a single extra page at the front advertising the Print Edition and other books by Keir Thomas, but this ain't so bad, surely? Check the md5sum and file size listed on the download page. If the file you have has a byte count or checksum that's anything other than this, download a new version. The file you have may be corrupted or even contain viruses/malware. Yeah! But remember that Ubuntu Pocket Guide and Reference is a copyrighted book, like just about every other book available right now. As the copyright holder, we ask that you share only the unmodified and complete PDF file, and don't charge a fee (i.e. you can't sell it). All rights are reserved. For more information, click here. No. The PDF Edition of Ubuntu Pocket Guide and Reference always be a US$0.00 download from this site, for as long as the Print Edition is sold. PDFs of successive editions of Ubuntu Pocket Guide and Reference will also be zero cost and will be released simultaneously with the Print Editions. There is no catch. You get a standard PDF file without any restrictions, such as DRM. You can keep it and use it for as long as you want. Look at it this way: It's like you've bought the PDF Edition of any computer book. It's just that you paid $0.00. Not at all. You don't have to buy anything. Nor are you obliged to—legally or morally. What better way to sell the Print Edition of a book than by offering the electronic version for no cost, so the reader knows exactly what they're getting? Our hope is that some readers, having seen the high quality of the book after reading the PDF Edition, will want to purchase the Print Edition. Although Ubuntu Pocket Guide and Reference is not community documentation, it's nice to offer something to Ubuntu users that they might find useful. If the book introduces just a few more people to the wonders of the world's favorite Linux then we'll be happy. I sell computers with Ubuntu pre-installed. Can I include the PDF Edition of Ubuntu Pocket Guide and Reference with computers I sell? Not without permission, so get in touch. Maybe we can do a personalized edition for you. Unfortunately not. However, the publishers of Keir's other books—Ubuntu Kung Fu and Beginning Ubuntu Linux—retail the PDFs at very reasonable prices. Why not complete your collection by purchasing them? Sure. There are no limits on who you can share the book with, provided you don't charge a fee for doing so, or modify the PDF file (for more information, click here). However, maybe you want to place a bulk order for the Print Edition of the book too? Bulk discounts are available at a very reasonable rate—contact us. Please don't. This is a commercially copyrighted book and converting the PDF to a different format isn't allowed. We made the decision to distribute Ubuntu Pocket Guide and Reference in PDF and Print Editions. There's lots of excellent Ubuntu community documentation available in non-PDF formats—just Google, or maybe start with the Official Ubuntu Documentation. No. You may only redistribute the PDF Edition file without any kind of fee required from the recipient. For more information, read the copyright statement. If you continue to sell the PDF knowing that you're doing so without permission, bad things may happen. Can I include the PDF Edition as part of a product I sell, or charge a fee for? Running an eBay auction in which you instant message the winner the PDF file (yeah, somebody did actually try this). Please don't. Just redirect your visitors to this website. That way they can be sure of getting the very latest edition. The white lines seem to be caused by a bug with Document Viewer (a.k.a. Evince), the PDF reader provided with Ubuntu. If a different PDF viewer is used, the lines don't appear (other PDF readers you can try include xpdf, gv, Okular, and Adobe Acrobat Reader; with the exception of Acrobat, all are available in Ubuntu's package repositories). The white lines do not appear in the Print Edition of the book. As for the blurriness, try zooming in or out a little to see if the screenshots become sharper. However, they aren't pin-sharp because it was necessary to reduce the quality to keep down the size of the PDF file. Note that screenshots look great in the Print Edition. Try using a different PDF reader. See the answer above for suggestions of others you can try. If you have no objections to using proprietary software, the best results are achieved using Adobe Acrobat Reader (if you're using Ubuntu, click here to download; select the Linux - x86 (.deb) option from the dropdown list). Although it has a clunky interface, xpdf also seemed to work well in our tests—it can be installed using Synaptic. If you're using the Sumatra PDF reader under Windows, upgrade to the beta release, or just switch to a different PDF reader. The numbers quoted are for the zipped PDF file. If you're checking the byte size and md5sum of the PDF file itself you'll see different figures. What are the vital statistics of Ubuntu Pocket Guide and Reference? It's approximately 8" x 5.25" and just 166 pages. Its ISBN (EAN-13) is 978-1440478291 (its 10-digit ISBN is 1440478295). The first edition was published in January 2009 and is available primarily through Amazon.com. The Print Edition of the book is retailed worldwide by Amazon.com. Because it's sold exclusively by the USA outlet of Amazon.com. Currently the book is not available through international Amazon stores. If this changes, we'll tell you straight away (sign up to the mailing list). Buying the book from Amazon.com and having it delivered to your home country is surprisingly inexpensive, and delivery doesn't take long. If you're interested in retailing the book, click here to get in touch directly with us. Generous discounts on the retail price are available for bulk orders. Contact Amazon.com. They take care of order fulfilment. If the book is faulty, ask for a replacement or refund. We've the greatest respect for community documentation but Ubuntu Pocket Guide and Reference is a commercially copyrighted book, like virtually every other computer book on sale right now. For more information, click here. However, there's some excellent community documentation for Ubuntu out there—just hit Google, or maybe start with the Official Ubuntu Documentation. Ubuntu Pocket Guide and Reference is not sponsored by and has no connection with Canonical Ltd, the Ubuntu Foundation, or the Ubuntu organization at large. In this regard it is identical to most Ubuntu books produced by computing publishers. You can read more about Keir Thomas by clicking here. He's an award-winning computer book author and editor. Ubuntu Pocket Guide and Reference is his third book about Ubuntu, after Ubuntu Kung Fu and Beginning Ubuntu Linux (both of which are best-sellers). He does the writing gig full-time. He is attempting to live the dream. The author says: "My office contains computers running Mac OS X, Windows, and Ubuntu. I've written books about SUSE Linux and Fedora in addition to Ubuntu, and edited several computer magazines all about Windows (and also a magazine about Linux). I don't think of myself as an Ubuntu zealot. However, IMHO Ubuntu is the best hope for the inevitable open source future (you do realize that proprietary software is just a historical blip, don't you?). Other versions of Linux are either industrial tools, or mainly for hobbyists. In my humble opinion, only Ubuntu offers a real choice for real people wanting to productively enjoy their computers and get on with their lives." Please submit an errata report using the contact page. Include the page number. Can I reproduce excerpts from the PDF on my website? It's possible, and we're flattered that you'd like to. Drop us a line and we'll chat about it. But please don't put any excerpts online before getting permission. Pocket guides are published by a variety of publishers. This particular pocket guide is published by MacFreda Publishing, a small indie publisher, and distributed primarily in the US by Amazon.com. There's no connection. No. The book is © 2009 Keir Thomas. All rights reserved. Click here for more information. The book isn't community documentation. It is not licensed under a Creative Commons license. A lot of Ubuntu Pocket Guide and Reference isn't specific to the Gnome desktop, so is great for users of any Ubuntu version. But as for a specific Kubuntu/Xubuntu version, well, anything's possible if we get enough feedback! Ubuntu has the biggest user-base right now, and therefore the biggest potential readership. In blunt terms, we fish where the fishes are. But we monitor the distro marketplace closely, and have years of experience of Linux. It should be pointed out that Ubuntu Pocket Guide and Reference is still largely relevant for virtually any distro that's based on Debian, uses bash as its default shell, and features the Gnome desktop (although the latter isn't too big an issue). This includes versions of Linux Mint, and gOS, for example. Contact us. As mentioned above, Ubuntu Pocket Guide and Reference is a commercially copyrighted book so adapting or modifying the work is prohibited without prior permission. It would probably be better if you worked on translating some of the extensive Ubuntu community documentation into your language. If you're looking for a book to translate, did you know that the Official Ubuntu Book is licensed under a Creative Commons agreement that allows the free and no-strings translation into other languages? You can find the text of the book here. We have permission to use the logo. In return for this permission, we have to point out that Ubuntu Pocket Guide and Reference is not sponsored by or affiliated to Canonical Ltd or the Ubuntu organization at large. Write a review of the book on your blog, and/or at your favorite forum, and/or at Amazon.com. Additionally, or alternatively, you might consider making a small donation. Doing so will encourage the author to produce further free-of-charge editions of the book. Ubuntu Pocket Guide and Reference was written from the ground-up to cover the essentials and be very concise. It's a pocket book. Beginning Ubuntu Linux is far more comprehensive, takes more time to explain things, and is a better all-round guide to Ubuntu. At about 700 pages, it's also a lot bigger. The two books complement each other very well. Of course. Click here for a slightly larger version. Use it how you want. Copy it to your own site. Don't hotlink. Click here. Don't hotlink this image! If you want a higher-resolution version, get in touch. If you use this image in your publication please let us know where and when. Thanks! Are there plans to update the book? Unfortunately an update is looking increasingly unlikely. Behind this decision is the fact that Ubuntu simply isn't as popular as it once was, making the book less likely to be commercially successful. The Linux distro scene has returned to the fragmented state it was in before Ubuntu turned-up. We can put this down to several questionable decisions made by Ubuntu head honchos, but the fact remains. That said, Ubuntu Pocket Guide and Reference still contains lots of useful information. It's just that some sections discussing the graphical user interface are now out of date. © Copyright 2009 Keir Thomas. Ubuntu is a trademark of Canonical Ltd.